What Does A Garage Door Opener Do? 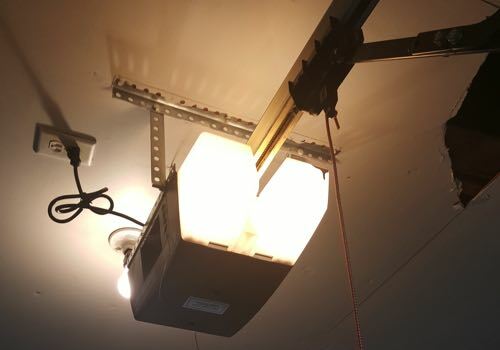 A garage door opener uses an electric motor to open and close your garage door. The electric motor provides a small amount of force to control how much the door opens and closes. It is also used to hold the door in place, and in some cases to keep the door shut if you don’t have a manual lock. Now, at this point you may be thinking, “A small amount of force? Garage doors are heavy! How does the opener open my door with a small amount of force?” The answer is that it doesn’t. Just like elevator controls don’t lift you up and down a hotel, garage door openers do not take on anywhere near most of the weight of the door. What Lifts Your Garage Door? True, your garage door could not automatically open without the help of your opener. You could still open it manually. What really allows you to open the door so easily is the torsion springs, and cables. Without the help of the torsion springs to counterbalance and take on 90% of the weight of your door, you wouldn’t have a prayer in opening it. The springs take on most of the weight and they are also connected to the shaft, and cables running along each side of your door. All of these parts, along with the chain or belt you use overhead, work together to move your door up and down every day. Your door also has rollers on a track on either side of your door that allows your door to move smoothly and on a certain path. So What If The Power Goes Out? Should you lose power, there is a release cord (usually red and hanging down from the top in front of the opener) that disconnects your door from your opener. This essentially puts you in manual mode. Once in manual mode, you can open and close your garage door manually, by simple lifting it with your hands. If lifting your door takes using more than one hand, falls when you try to set it, or shoots up while you are lifting it, then your springs are likely out of balance. It is important that your springs not be wound too tightly or not enough in order to make your garage door last longer and be safer for your family. You can usually avoid any spring balance issues by getting a routine annual check-up from your local garage door company. It doesn't take long, and it provides peace of mind and a longer lasting spring. Woohoo! So now you know how garage doors work. What a piece of engineering. Your garage door opener does play a key role in opening your door, but it wouldn’t have a chance if it weren’t for the springs taking on all that weight. Plus there’s the cables, belt, rollers, and track to thank as well. Interesting, to think that there’s legitimate machinery at work in your home every day. If you have any questions or things you’d like added in today’s post, just leave it in the comments below!